Buhari’s visit: Heavy security presence in Jos – Royal Times of Nigeria. Security has been tightened up in most parts of Jos, Plateau State, ahead of President Muhammadu Buhari’s two-day working visit to the North-Central State. 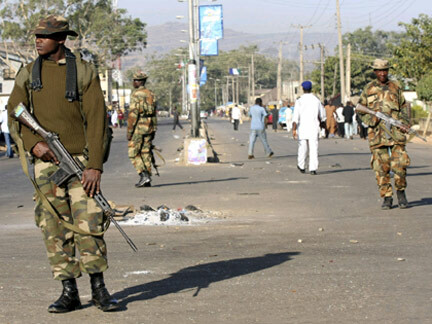 Correspondents of the News Agency of Nigeria (NAN), who went round the city, observed heavy security presence with fierce-looking armed personnel in areas considered as flash points. NAN also observed that armoured tanks were positioned around many roundabouts in the city centre, while various teams of security personnel in siren-blaring vehicles were seen patrolling the city. Mr Terna Tyopev, the Police Public Relations Officer (PPRO), who spoke to NAN, said that the strategy was to ensure “visibility policing” and facilitate quick response to distress calls. “The heavy presence of the security personnel is deterrent in nature; it will create fear among members of the public, particularly those with evil intention,” he said. NAN reports that Buhari, who is visiting Plateau for the first time since he became President in 2015, is expected to inaugurate some road projects and also launch the state’s tractor ownership scheme. NAN.